Below are a selection of the most common questions we are asked, along with their answers. The list of questions is fairly extensive, so skimming the questions to find the ones that pertain to your situation will save you time. However, if you have the time to read through the entire list, you will get a great overview of giclee fine art reproduction. If you have questions and can't find the answers here, we can be reached using the live support chat button, or via e-mail or phone by visiting our Contact Us page. What are the most common types of art reproduction? Traditional limited edition reproductions in the past have been printed by lithography, which is basically standard offset printing like that which is used for advertisements, business cards, and brochures. Some people have used, and continue to use photographic process to reproduce their artwork. Today, giclee printing is the most popular type of art reproduction. In our opinion, giclee printing is the best option, which is why we choose to reproduce artwork using this method. The disadvantages to lithography are the great deal of expense required to prepare to print, so you must print 500-1000 or more of each image to make it cost effective, the longevity is generally poor (from 5 to 25 years), you can typically only print on standard paper stocks, and the quality is not the best that is currently available. It is also common for the color to vary throughout the print run so all your prints don't necessarily look the same. Photographic reproductions typically have longevity around 15-20 years, don't capture fine details as well, and are printed on photo paper since they are basically photographs. You have virtually no ability to perform subtle color corrections to specific areas of the print, which makes precise color matching almost impossible. Some newer photo imaging devices like the Lambda and Lightjet printers are even worse since they have very low resolutions of 200-400 dpi. Photo prints are also more likely to shift in color from one batch to the next since the color is affected by the developer chemicals. The type of giclee printing we provide offers the highest image quality, greatest longevity, and the ability to print directly on art medias such as watercolor papers and canvas. The technology used to create giclee prints has very high color repeatability, although this can be a problem still for companies that use poor quality inks and don't maintain their equipment properly. Giclee reproductions are typically printed in smaller limited editions of 50-500 which, combined with the higher quality and longevity makes them much more valuable. A typical limited edition giclee print will sell for more than a lithograph by anywhere from one hundred to several thousand dollars. Combine that with additional benefit of being able to print on demand in small quantities, and you can see why giclee printing is the most popular option for art reproduction. Which option is the least expensive? That depends on how you look at it. Lithographs offer the lowest cost per print, but there is a high setup cost which makes it necessary to print a minimum of 500-1000 copies of each piece in order to defray these costs. This large out-of-pocket investment makes lithography a big risk for anyone who isn't sure they will sell 500-1000 copies of their art, which is why many newcomers or those without a big budget were unable to offer reproductions before giclee printing became available. Photo prints can be fairly inexpensive and done in small quantities, but see "Which option is best" for their limitations. Giclee printing has lower setup costs than lithography and since you can print any quantity on demand, there is no need to pay for more prints at one time than you need. The cost per print is higher, but the initial out-of-pocket costs will be lower since you don't have to pay for and store a large number of prints. And, since quality giclee prints can be sold for a higher price than lithographs, you will make a greater profit per print as well. So, if you have a buyer for 1000 prints of your work, who is not concerned about longevity or the best print quality, lithography would be a good choice. But, for everyone else, giclee is the most cost effective, as well as the highest quality option. What is Giclee and how do you pronounce it? Giclee is a term that was invented to describe the process of high quality inkjet printing for art reproduction purposes, without using the term inkjet, since it makes people think of their desktop printers at home and, in theory, giclee printing should be much more. It is pronounced zshee-clay. You talk a lot about quality. What exactly are you referring to? Quality is our main focus and as such, it's an area of particular sensitivity to us. We see quality as composed of three elements; the quality of the digital image, the quality of the color, and the quality of the printing. If any of these suffers, so does the end product. Some of these items are somewhat subjective, and some are subtle, but all are important to us, and we feel should be important to our clients. Image Quality. The original should be properly captured and this includes the photography and/or scanning of the original as well as retouching. The image should be an accurate representation of the original. This means it can't have too much contrast, be out of focus at the edges, or have shadows that are too dark or highlights that are blown out. 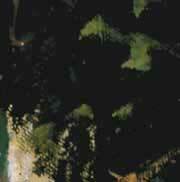 It should show the brush stroke detail in an oil or acrylic painting, or the paper texture in a watercolor, without excessive glare or reflection off the highlights or shadows. There should also be no flaws such as scratches, dirt or other marks visible in the print. Color Quality. The color should be accurate compared to the original. Subtle colors and transitions should be preserved. It's surprisingly common to see poor quality color adjustments in reproductions. Over saturated colors, blown out highlights, and plugged up shadows can be seen in a shocking number of commercial reproductions. It's difficult to tell if this is due to bad capture, bad color correction, bad printing, or some combination, but all are avoidable. Print Quality. The ultimate goal is to make a print where there is no sign of the technology used to create it. A lower quality device will allow the printing dots to be visible to the naked eye, sometimes without even looking that closely. Usually this will be most noticeable in the highlight areas, or in the darker colors of the print, referred to as the 3/4 tones. Lower resolution printers will also not be able to accurately recreate the fine details from the original, even if they are present in the scan. Some printers use inks that do not provide a sufficient color gamut, so that even if everything else were of a high quality, the final print would suffer from poor color. Physical defects such as narrow lines in the print, called banding, that are a result of improperly maintained or calibrated equipment should not be noticeable. Also, even a high quality printer can be run at a faster, lower quality setting. This can have a negative impact on the final print that is difficult for the average person to spot, but we know what this degradation looks like and it is also surprisingly common. Usually it shows up as a loss of detail in darker areas where the ink is coalescing and causing those areas to look muddy and low contrast. It is difficult for some artists who are not familiar with these technologies to spot some of these telltale signs of poor quality. However, most artists should be able to spot image quality problems like those described above. These problems can be avoided and the artist should not accept them. Certainly there is some compromise involved in the reproduction process, but we think many printers are using this as an excuse and too many artists are accepting it. Everyone says their prints are best. Why do you think yours are best and why should I believe you? When we first started reproducing artwork, there was no such thing as giclee. We already had a $60,000 prepress scanner and over 10 years of experience in scanning and color correcting images for print. Because we bought the first printers made that were good enough to do this work, we were about a year or two ahead of anyone else in learning the ins and outs of this new breed of equipment. We invested heavily in color management software and hardware because we already understood how it worked and realized it would be necessary to produce accurate and repeatable color. These days most capture is done digitally, so our prepress scanner doesn't work as hard as it used to, but the techniques used to capture original artwork digitally are basically the same as with scanning film or originals, and the techniques we've developed over the years for color matching are unique and unmatched in the industry, so we know that no one can do a better job of capturing and color correcting original artwork. We have a state-of-the-art color management system and carefully custom create our own ICC profiles for every ink and media combination on every printer. And, we have the latest and very best printers, which we keep updated as new technologies come on the market so that we always offer our customers state-of-the-art quality. There is no step in the entire process of reproducing an original that isn't being performed by someone who is the best at that particular step. And perhaps the most important reason is that at Power Graphics, your job is always printed by a professional who actually knows what they are doing and cares how your print turns out. As far as why you should believe all this, you don't have to. We've always had the policy that if we not able to produce a proof that was acceptable to the artist, we wouldn't charge them for our work. So, there is no risk in trying us to find out for yourself what we are talking about. Why are you so expensive/why are you so inexpensive? We actually hear both of these questions and the answer to both is the same. Our goal is provide the highest quality fine art printing available anywhere, and we charge the lowest price we can within the parameters of that goal, which ultimately equals the best value for the money. Based on our research, we believe our prices are very competitive, which is important to us because we want as many artists as possible to be able to use our services. Also, by offering the best price we can while still making a profit ourselves, we allow the artist to make a profit on the sale of their prints, which creates a winning situation for everyone. It would certainly be possible for someone to undercut our prices, it seems there is always someone willing to do this, but you'd have to decide if it was worth sacrificing the quality of your reproductions to save a few dollars. Companies like copy shops, sign shops, and small providers with individual printers are not equipped to provide color consistency over time, or even from print to print. Those who just want a color print and aren't particular about color accuracy, print quality, or consistency, have many providers to choose from. We offer these types of prints as well under our Printing for Indoor Use section, although all our prints have our signature color accuracy and print quality is always state of the art for each material. How long will your prints last and how do you know? We use several ink sets with different longevity ratings depending upon the printer that is being used, but basically all our different inks are rated at over 80 years for fade resistance. These numbers are all based on accelerated light fastness testing conducted by independent testing facilities. They assume that if a print is exposed to a certain amount of light each day while on display, and they expose a test print to 100 times more light, that this would be the equivalent of 100 days on display. Since this technology hasn't been around for more than 20 years, obviously no one knows for sure if these numbers are correct, but they are the only method we have for evaluating the longevity of inks and since all these test are done the same, the results are at least a good measure of the relative longevity of different inks and processes. For example, if our inks are rated at 100 years and a photo print is rated at 15 years, and the process has overstated the longevity by half, our prints will last for 50 years and the other will only last for 7 or 8. In any case, we believe that this testing is accurate enough for us to be comfortable in quoting their longevity numbers. Isn't 15-25 years long enough for an art print to last? We don't think so. We've heard this argument, mostly from printers who are stuck with outdated and discontinued equipment. The argument goes something like, it's a digital print, if it fades, we can just print another one. Or, what do you care if a print fades after 15 years? Who's going to complain after that much time has passed? We think that fine art printing should last as long as possible, and certainly through a few generations. Otherwise, they're just posters or some other form of temporary decoration, not true limited edition fine art reproductions. Even if you're not concerned about longevity, your customers probably are, or would be if they knew there was a difference. This is especially true for limited edition prints that often sell for hundreds of dollars with the expectation that the print will last for a very long time. No. The term giclee has become so overused as to be meaningless. Everyone with an inkjet printer is claiming to provide giclee prints so it's very important to ask questions and find out exactly what you're getting. There is a wide range of quality, longevity, and of course pricing, so be very careful when choosing a giclee print maker. What types of printers are used for giclee printing? The original giclee printers were from Iris. They offered good image quality, but poor resolution and longevity. There were models of printers from companies such as Epson, Roland, Canon, Hewlett Packard, Encad, Mimaki, Mutoh, Colorspan and Kodak that could be used for giclee printing, but many of these models were not designed for this type of printing, although virtually every manufacturer had some models that could be used. The print maker's expertise with a particular device can make a huge difference so even some models that would not normally be used for giclee printing might be acceptable, or normally accepted models might be inadequate in the hands of an amateur. Many businesses and individuals also use consumer desktop printers and call them giclee prints. Which type of printer is best? This is a matter of opinion and of course printer manufacturers are constantly updating their equipment so the best printer on the market doesn't usually stay that way for very long. We began using Roland printers when they were the best, and switched to Epson printers when they surpassed Roland in print quality. We currently have printers from Canon, Roland, Epson, HP, and EFI that are used for different printing materials. Most currrent printer models are using extended colors of inks that produce some very nice images. Something that most people don't realize about these printers is that each manufacturer tunes their printer to the various medias they offer. Some manufacturers allow access to control over the printer so you are not limited to the settings that are provided with the printer. Each manufacturer spends a great deal of time and effort to make sure their medias print well with their printer, but unless they allow that control, there is no way to get the best possible color gamut and print quality from the printer, especially on materials that the manufacturer doesn't sell. So, for a home user who purchases one of these printers and only prints on papers that are sold by that manufacturer, they could get very nice results. But, without access to complete control of the printer, they could never improve on what the manufacturer has done, or achieve full quality on third party materials. There are potential problems in doing this, so a great deal of technical expertise and patience is necessary to really get the maximum quality from each device. Once you reach a certain resolution, there is less difference in the quality that the printers are capable of producing. Printers that use lighter density black inks have an advantage over any printer that doesn't have this feature. If properly used, this enables the printer to produce neutral colors more accurately without sacrificing image quality. The Canon also has the additional colors of red, green, and blue, Epson has added orange and green to some of their printers, and HP has added chromatic red. These extra colors are designed to increase the color gamut of the printer to make it possible to print colors beyond what is normally possible with CMYK inks. Obviously, none of the manufacturers agree on how best to achieve an extended color gamut, since they each take a different approach, and there is some speculation that these extended inks don't help as much as the manufacturers claim, but in the upper echelon of printers, the skill of the operator will have much more to do with quality of the output than the printer being used. Won't everyone who has the same equipment provide the same quality? No. This is a common misconception and some artists actually shop for a fine art printer by the equipment they use. While the equipment is important, there are many other factors that go into a quality print, and we provide them all. Even if two companies were printing using the same printer and the same file, the finished product can be drastically different. This is difficult for some people to accept, but factors such as color management, the use and accuracy of ICC color profiles, the willingness to sacrifice speed for quality, thorough knowledge of each particular printer and how to maximize quality for each one, and our ability to modify the print drivers to achieve results that are not possible "out of the box" all make our prints that much better. Most consumers and print makers aren't aware that by default, most printers are designed to print in a mode that will help hide any flaws in the output. The method varies by manufacturer, but in general, the dot pattern used to print the image is designed to minimize the visibility of defects caused by faulty or misaligned print heads. However, the printers are capable of a much higher quality print, but this cannot be obtained by using the manufacturers print drivers. That's why we don't use theses drivers, but not many print makers have the knowledge or ability to do this, and why our prints are of a superior quality. Your samples look great, but are they really better than your competitors? Trust your eyes but use your head. Samples are nice because you can see the medias and the print quality, but they don't really tell you much about the company's ability to accurately reproduce your artwork since you probably don't know what the images on the samples were supposed to look like. In order to find this out you're going to have to give a company a chance to do your reproduction, and that's why we have always offered a guarantee that if we couldn't match an original to the artist's satisfaction, we wouldn't charge for the proofing. That way, you are free to try us and see if what we are saying about our quality is really true. Do you work with individual artists on small jobs, or only on large jobs? We work with all artists and photographers on any size job. In fact, we do far more small jobs than large jobs because the nature of giclee printing means we do lots of small print runs as they are needed. We know artists and enjoy working with them. While many companies complain that artists are too picky, we've found that, in general, we're more particular than they are, which is why so many artists and photographers are thrilled with our work. Basically, the old advertising slogan of 'No job is too large or too small,' would apply to us. My photographer/photo lab/copy shop does giclee printing. Are their prints as good as yours? No, but that doesn't mean their prints look bad, they just don't do the things required to produce the entire tonal range of a an image without losing any color gamut, and to be able to produce the same color 6 month or 3 years later. These things require significant skills and equipment which are not the same as those needed in photography, photo developing, copying, etc. Many people think that if a photo lab processes their film accurately and gives them good photo prints, they must also do good scans, captures or good giclee prints. Unfortunately, this is not the case. Some of the worst quality scans and prints we have ever seen have come from very good photo labs and photographers. Unfortunately for artists, the general perception in the digital printing industry is that art printing is a nice sideline to increase your profits by printing on canvas. At a recent sign industry trade show there were seminars on how to improve your bottom line by producing fine art prints, as if sign shops were in any way qualified to reproduce artwork. We like to point out that unlike many other companies who offer fine art printing services, this is a main part of our business, not a sideline. It's not just a way for us to generate extra revenue with our other equipment. We have specific equipment purchased specifically for photo and fine art printing, and have different equipment for our other types of printing so that our quality is the best for each type of printing we offer. How do I know that my work is protected and that you won't sell prints without my permission? This is one of the most common questions we're asked. Basically, there is no way to be completely safe from this type of abuse and the best thing you can do is work with a reputable printer that you trust. We do several things to make it easier for our clients to feel comfortable in working with us. First, we have a reputation to protect. Unlike some companies who don't have much invested in their business, we have significant amounts of time and money invested in building our business, and nothing would jeopardize that faster than taking advantage of our clients. If that trust were ever violated, it would be very difficult to continue to do business. Second, we state our guarantee that the only prints we make of each piece is part of the limited edition on our certificates of authenticity. Having this statement in writing makes many artists feel more comfortable. 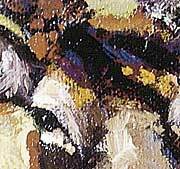 We do often place small thumbnail images of artwork on our website's gallery page to show off the work of our clients. We've gone to a great deal of effort to ensure that the larger versions of these images cannot be saved or printed to keep visitors to our website from illegally copying our clients work. We have also used portions of a select few images on our printed samples so that prospective clients can see a printed image on each media to better judge their qualities. Because the samples are small, about six inches square, and to protect the image from copying, we only use a section of each image and clearly give the artist credit so that there is no question. Lastly, we don't sell artwork. There are many businesses that provide print making services as well as acting as galleries or agents to sell the work. We are receiving more and more requests from artists who would like us to offer prints for sale, and it does seem like a natural extension of our business, but we feel this situation might make some artists uncomfortable, as there is no way to verify that all the prints being made and sold are properly accounted for. This is why we have not offered any prints for sale. Until we can devise a system that will not create an atmosphere of distrust that we see with other printers who sell reproductions, we will continue to refrain from selling prints. Ultimately, anyone who has access to your images and wishes to cheat you could find some way to do it. In our case, we never have nor ever would sell a client's reproductions without their knowledge. We would have far more to lose in doing this than we could ever gain. What are certificates of authenticity? Do I need them? Where do I get them? A Certificate of Authenticity is a document provided with each limited edition print that certifies that print is authentic and provides details such as the specifics of the original and the number of the print in the edition that the certificate is for. Not every artist provides certificates with their prints. Open editions or any series of prints that aren't numbered and signed by the artist wouldn't typically need one, but they are common and make a nice selling point. Galleries in particular seem to like them. We used to offer certificates, but it was too difficult for us to produce them since all our equipment is designed for large prints and not the small certiciate size prints, so we stopped offering them. Most certificates are very simple and can easily be produced by the artist on a copier or desktop printer. The certificate should include the details on the original, such as the name of the painting, the size, the medium and the dimensions. Other information such as the date is was painted and any interesting background on the painting is often included. It should also include the details of the reproduction, most importantly is the size of the edition and the number in the edition of the print. How long will it take to reproduce my artwork? On average it takes about two weeks to complete the scanning or capture of the original, initial color correction and proof. If you provide a digital file with the original, it takes about a week to complete the color correction and proof. If a file is submitted with no original or proof for matching purposes, it takes 3-4 days to print a proof or to print the actual job if a proof is not requested. The initial phase is the most time consuming since it involves the color correction process, but it is best not to rush this portion of the process since it could negatively affect all your subsequent prints. Once the proof is received by the artist, they can either approve it as is, approve it with changes, or request changes and a new proof. If a new proof is necessary, allow about 2-3 days to complete this new round of color correction and proofing. Once the proof is accepted, printing usually takes about 3-4 days, depending on the size of the order. So, about three to four weeks from start to finish is average, but if you have a particular deadline, we will juggle as best we can to accommodate you. If you have a major rush and we must bump other jobs to complete yours, a rush charge will be required. What about reprints, how long do they take? Reprint orders are usually completed in 4-5 days and can be done faster if necessary. Since we keep the final, color corrected files on hand and ready to print, the reprinting process goes fairly quickly. This enables artists to accept orders for prints and fulfill them within a week, thus reducing the need to carry an inventory of prints on hand. How much should I charge for giclee prints? This is probably our most frequently asked question, and one of the most difficult to answer. The real answer is you should charge as much as someone is willing to pay, but that's not very useful. As a guideline, giclee prints generally sell for 10-20% of the price of the original. The lower the cost of the original, the more expensive the giclee print would be as a percentage of the cost of the original and vice versa. For example, a giclee print of an original that cost $100 might cost $20-$25, or 20-25% of the cost of the original, where a giclee print of an original that sold for $10,000 might cost $500-$1,000 or 5-10% of the value of the original. That's really just a guideline, but it's a good range to start with. Ultimately, the market will decide the value of your prints. In our experience, you should be careful not to price your prints, or your originals, too low. With artwork this sometime has the reverse effect and makes customers feel the print or original isn't as good as prints that are more expensive. It's important to find the right balance to get your prints priced where they will sell the best. Will prints I order later look just like the first ones I received? Yes, we go to great lengths to ensure this. The equipment we use is very color stable, as are the inks. Since the inks are produced to exacting industry standards, and we only use the manufacturers inks, there is no measurable color shift from one batch of ink to the next. To further ensure there is no problem, we regularly recalibrate to account for any variation in the ink, equipment, or environmental conditions that could affect the output. We also keep a small proof of each original on hand so that if there is any question about the accuracy of the color, we have something to refer to as a control. This is useful in the case of an equipment malfunction or other unusual occurrence. None of this is usually necessary, but it's important to have these controls in place just in case. Can I get a copy of your files of my artwork? Our policy on this is that we will provide the finished files at a smaller size that is large enough to use for postcards, greeting cards, brochures, advertisements and websites. We can also provide the raw, un-color corrected files. We will also provide the full size files for those who wish to pay our regular prepress rates for scans and color correction time. The reasoning behind this is that the smaller size files are large enough for anything but printing the full size reproductions, so unless an artist is planning to take our scans to another printer, they would have no need for them. If they do want to take our scans to another printer, then they need to pay our regular scanning and color correction rates, as the rates we charge artists are greatly discounted when we are also doing the printing. The only other reason for the artist to have copies of their files is for safe keeping should anything happen to our files. See "What do you do if something happens to my files?" for the explanation why the artist doesn't need to have a backup for that reason. We're sorry to have to implement this policy, but too many people were taking advantage of our scanning and color correction expertise without paying for it. What do you do if something happens to my files? Once your images have been color corrected and the proof has been approved, we make backup copies of the files for safe keeping and a duplicate is kept offsite, so there are three copies of the file for safety. Plus, our main storage has a redundant backup system to protect against equipment failure. We can also make a reduced-size copy of your files on CD for you to keep as well. This is included in our prepress package or can be ordered separately. This has the added benefit of allowing you to use these color corrected files for other purposes such as promotional brochures or advertisements. In the unlikely event that something happened to every copy, the process could be done over, but this would a big inconvenience to everyone so we take these steps to ensure this doesn't become necessary. So far, we have never had a problem with a single primary copy of an artists file, so none of the backups have been necessary. I don't live near you. Is that a problem/can you recommend a company close to me? We do more work outside our home state of Utah than we do locally. We have large numbers of clients on both coasts and even do work for clients overseas in places like Monaco, Greece, New Zealand, the Caribbean and the French West Indies. In reality, we seldom get to meet the artists we work for in person, instead relying on phone calls and e-mails. This is even true for local artists who find it more convenient to work the same way. So, no, it's not a problem if you don't live near us and no we don't know of other companies who do this work that we are comfortable recommending. Do I have to send you my original or can you work from my file or photo? While it's helpful to have the original for color matching purposes, it's often not possible or practical. In those cases we recommend sending us a quality 4x5 or larger transparency, or having a professional digital capture. Slides, negatives or prints will work too, but not as well. Slides are fine for small reproductions, but at sizes above 11x14, the film grain starts to affect the quality, especially at sizes above 16x20. Negatives can also be used but the color is frequently different than the prints that were made from them due to the fact that whoever developed the prints probably made adjustments that aren't reflected in the negatives. Negatives are also typically more grainy which is usually not desirable. We have tools to minimize or eliminate the grain, but there will be some loss of sharpness and/or detail, so a larger transparency is still preferable. Prints can also be used but the quality will not be as good as from a transparency so they are not the best choice. We will obviously need to rely on your feedback for color correction when we don't have the original, but this usually goes fairly smoothly. You do have to change your expectations for the first print, however. Since we only have the transparency for reference, and these are frequently not exactly right, there could be some fairly significant adjustments necessary after the first proof is reviewed. So, don't be shocked or disappointed if the first proof is off in these cases. If your transparency is very good, the first proof will sometimes be the only proof. We've been called geniuses by our clients on more than one occasion because their first proof was judged perfect, when in reality, the photographers who shot the transparencies deserved at least half the credit. What if I create digital art, can you print from my files and what formats can you accept? If your work is created digitally, then you obviously don't need any scanning or photography of your art. You can submit your file electronically with your order, or you can also send them on disk or CD. We always recommend a proof since many artists are working in RGB color mode on uncalibrated systems, which can lead to some significant variances between what the artists sees on their monitor or printer and the information that is actually in their file, which is what we will print. Even if this is not the case, a proof is always a good idea so that you can see exactly how your prints will look before ordering any quantity of them. If you find any corrections are necessary, you can either make them yourself, or have us do it. We prefer CMYK tiff or Photoshop files as they allow the artist to see their work in the color space it will print in, but RGB files are also fine, and can actually provide better results when printing on glossy medias such as photo paper and canvas. If you are uncertain about the quality of your CMYK conversion, then feel free to leave it in RGB and we can determine if it's best left in RGB, or if necessary, we will convert it to CMYK for you. Do you provide color profiles I can use so my files will print correctly? This is actually not necessary with a full color management system, such as the one we use. This usually takes some explanation, so here is our simplified color management lesson. In order to print accurate color from any printer, a color profile must be created. There are variations on the process, but basically a calibration is done by printing a set of color swatches and measuring them with a spectrophotometer, establishing an ink limit, and then creating a profile by measuring a set of 500 to 3000 color swatches. This has to be done for each combination of printer, printing material, resolution, dot pattern, print passes, etc. Periodically, the calibration or linearization must be updated to account for variations in humidity, printer performance, temperature, etc. So, as you can tell, it's quite a bit of work to create high quality color profiles. Like most things, there are high end and low end ways to create profiles, just as their are high and low end ways to use them. The simple, inexpensive way to use a color profile is to open an image in Photoshop or another image editing program, and apply the profile directly to the image. This will, in effect, change the image so that when it's printed with that same combination of printer, material, resolution, dot pattern, etc., it would come out accurately. It's in this scenario that you would need a color profile for your image to print correctly. While this method employs color management, it's not a color management system. In order for you to get accurate color in this setup, you have to have the specific profile for the combinations we mentioned before. Once applied, the image is altered and will only work with that combination. If any single aspect of the job changes, the color will not be accurate. As environmental conditions change over time, the profile also becomes invalid. As you can see, this becomes a logistical nightmare and it's the main reason why this method tends to produce less accurate color, and less consistent color from one job to the next. It's really because it's so much work to keep track of all these profiles, remember which ones are applied to which images, keep track of the version of the profile that's applied when it get's recalibrated over time, etc., that makes most people who use this system take many shortcuts and therefore never get a high degree of color accuracy. A full color management system, like the one we use, works a little differently. It detects any color profiles assigned in a file, called input profiles, and converts the color using the profile we've created, which is the output profile, so that the color will match as closely as possible. All the different output profiles we create are stored and used by a dedicated raster image processor, or RIP. The RIP keeps track of all the color profiles for every printing material, dot pattern, resolution, and more, and automatically uses that profile when the image is printed. All the profiles are maintained in one location, and if any of them get updated or recalibrated, the new version replaces the old version so any time an image is printed, the most recent profile is always used. Likewise, if any parameters such as resolution or dot pattern change, the proper profile is used. This has several additional benefits. Because the profiles are managed by the RIP, it takes the management of all those thousands of profiles and their updates, and makes the process automatic, freeing us up to concentrate on the quality of the profiles themselves. It also means that your original image is never altered. We can use the same image on any printer or material, with any kind of ink and at any resolution, and have them all print essentially the same. Without a full color management system, each different use of the image would require a different file, and each of those files would have to be updated or recreated every time they were printed. So, you can see why an actual color management system is ideal, and it's why there is no reason for us to provide color profiles for you to apply to your images. Can I photograph my own artwork? Yes you can, but that doesn't mean you should. If you honestly feel you can do as good a job as a professional, then there is no reason to have someone else do it. If, however, you don't have the proper camera equipment, the proper lighting, and the skill to pull it off, spend the money and have it done right. If your transparencies are poor, the reproductions will suffer and it's not worth it to save a few dollars. If you're using a digital camera that doesn't have sufficient resolution, you will have a loss of detail and sharpness and shouldn't expect the same quality you would get from film or a high res digital capture. Below on the left is an example of a digital photo taken by a professional at a photo lab compared with the same image on the right that was captured with a high res digital back in our studio. You can see the difference in detail that was captured by our process. We could sharpen and improve the digital camera image, but it will never be as good because it doesn't contain as much information. That being said, if you do wish to photograph your own artwork, here are some things to keep in mind. First, use the highest resolution camera you can get your hands on. We have special software we use to enlarge smaller files for printing at larger sizes, and it does a remarkable job. However, the more information we start with the better the results will be. So, even if you have to rent or borrow a camera, get the highest resolution you can. Cameras at 18-24 megapixels are not that hard to find, and there are some professional cameras now with resolutions as high as 36 megapixels or higher. The extra effort you go to in getting a higher resolution photo will make every print from that image that much better. Try to shoot the photo as square to the original as possible. It's not too difficult to fix a certain amount of skewing if you aren't perfectly square to the original, but it may cause the focus to be off from one side of the image to the other if you're not square. Also, if you don't have professional lighting, you'll have to make sure that you get bright even lighting when you photograph your original. Shooting outside in the sun can work as long as you don't get glare off the surface. You want to avoid bright and dark areas in the photo, so you shouldn't use a flash unless you have a high end setup that will allow you to diffuse the flash for even lighting. Also, unless you're using a professional lens, and sometimes even if you are, it's a good idea to not have the image fill the entire frame. Lens distortion is common on the edges of less expensive lenses, and even occurs to some extent on professional lenses, so if you make the image a little smaller in the frame, you are more likely to have consistent focus and sharpness. If you follow these guidelines, you will be able to get the best quality from your own photographs. They will not be as good as a high res studio capture, but if you follow all these suggestions, they should be acceptable. Can I scan my own transparencies and send you the file? Yes, but make sure you know what you are getting. There are some fine prepress shops out their that produce very nice scans, but there are fewer than there used to be due to the change to digital photography. We get files from people all the time who do the scans themselves or have a friend with a "really good scanner" and the results are usually disappointing. Don't forget that if the scan is bad, the prints will be bad. Ultimately, the print is just an accurate representation of the scan, so there is no way a bad scan will produce a good print. We often do comparative scans for clients who don't believe that our scans are that much better than theirs. When we print their scan and our scan side by side, it usually convinces them and ends the discussion. The example below will help illustrate this. This example shows a scan that was done by a professional photo lab. They shot the transparencies for one of our clients and offered to do his scanning as well. He assumed their scans would be good since they were professionals and their photo processing was of good quality. Below is a comparison of their scan with our uncorrected scan. This first comparison shows the overall image so you can see the color difference. Since internet images are low resolution, it's difficult to tell the difference in detail from this example. You'll have to take our word for the fact that the color in ours is correct, but you can see that the shadow areas in our scan on the right still show detail while the other scan on the left does not. In the next sample, we show a close up of some detail areas so you can better see the difference between these scans. The scan on the top shows the shadows are so dark that you can no longer see the detail in these areas and the finer details like the brush strokes have been lost. There has also been some loss of color with the blues turning gray. Some of these things cannot be corrected for. While we could work on the scans from this photo lab and make them better, the artist would have to pay for this work and they would still not be as good as the raw scans that we did ourselves. Even these detail areas are reduced from the actual size of the scan, but you can see that a reproduction printed from our scan would be far superior to one printed from the other scan. There are many fine scanning and prepress operations out there, but there are also many that are not, and since we greatly discount our scanning prices for our printing customers, there should be no cost savings by using a different service provider for this important step. If, however, you already have a high quality scan of your artwork, it would be foolish to pay to have it done again when we could easily use this existing file. So, keep costs in mind, but don't sacrifice the quality of your reproductions to save a few dollars on the setup costs. That depends, but probably not. Most users don't have calibrated systems and color management software that drives their desktop printer. Without this, the results from a desktop printer will not be accurate, even if the prints come out as expected. This, in fact, is the biggest problem. An artist will adjust a file until it looks good on their screen or from their printer, and then send us the file, not realizing that the print they've made isn't really an accurate representation of what's in their file. When we make an accurate print, they are surprised and/or disappointed with the results. That's why we always recommend a printed proof so that the artist can see what the prints will look like coming off our system and they can then make adjustments, or have us make them, to compensate for the difference. The best thing you can do to ensure the prints we make match what you see on your system is to embed your working color profile in the image when you save it, and/or send along a print that shows what you would like the print to look like. That way we can look at your files on our calibrated system and if we see any significant difference, we can make adjustments so that your image will print like you intended. I understand that you can't exactly match my original, but how close can you get? Actually, we probably can exactly match your original, but it can be very expensive to do, so most artists settle for a very close match. This is really up to the individual and we enjoy trying to make a reproduction that is indistinguishable from the original. We once did a reproduction of a delicate pastel that was so exact, when we were through, the artist came to take the original for safe keeping and took the reproduction by mistake. However, it can take many rounds of color correction and proofing to make an exact match, and since the people who purchase the reproductions will never have the original for comparison, you have to decide how important such a precise reproduction really is. We think it's very important for the prints to be a very close match and accurately represent the "feel" of the original, although some artists are relatively unconcerned about the accuracy and just want the prints to look "good," and we can do that too. Is a proof really necessary if I just want the print to look like my transparency or file? It's always a good idea. With transparencies, there is only one way to view them that will give you an accurate representation, and that's to view the transparency on a color corrected light table. Since most people don't own one of these, they hold the transparency up to the light and judge the color not realizing that the color will look very different depending on the type, color temperature and intensity of the light source. We frequently get transparencies that the artist feels is very accurate and then is surprised when they receive the first proof, thinking that the proof is off when in reality it's a fair representation of the transparency they thought was accurate. Certain films create excessive contrast and cause some colors to shift, and the scanner has more trouble accurately capturing some colors, so with all these variables, a proof really is necessary so both of us can see where the color is and decide if adjustments are necessary. You certainly don't want to find out the color is off when you receive your first prints. Of course, if you send the original or an accurate color representation, we can make any necessary color adjustments before you ever see the proof. As for files you submit, see the answer to "Will the prints you make from my file look like the ones from by desktop printer?" above. Why does it take so many proofs to match my original? This is covered to some extent in some of the other questions, but there are several degrees of accuracy possible with each reproduction and you have to decide how close you want the prints to be compared to the original. In order to get an exact or very close match, it is often necessary to make subtle color corrections to different areas of the painting. For instance, if the entire transparency has picked up a blue cast, it's very easy to remove this, but in most cases one area of the scan will have too much blue, but removing blue (cyan) from the entire image will throw off other colors that don't have too much blue. The trick is to selectively correct only the areas that need it and to adjust any area that is off so that the entire image matches the original. We have developed a proprietary technique that makes the scan an almost exact match to the original painting, but it requires we have the original, which isn't always possible. 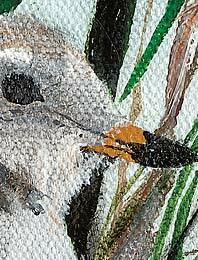 If your transparencies are off, this can involve so much work that it's almost as if we are repainting the original. Once the image is close, it can take several proofs to check the progress of these corrections and make the subtle adjustments that ultimately separate a quality reproduction from a poor one. Neutral colors are particularly difficult because even a small adjustment can have dramatic impact. Most artists have experienced this and understand how tough this can be. Since we charge for each proof, which includes the color correction time, we don't like to make a large number of proofs without showing the artist first. That way they can make the decision as to whether or not the image needs further correction. Often, artists will accept color variances that we would have fixed had it been left to us, and in some cases, the artist will see some differences that they actually prefer to the original. So, while we are extremely good at making these adjustments, and we try to adjust the image to be perfectly accurate with each round of corrections, it takes as many as are necessary until the artist is satisfied. We have no interest in prolonging this process because while we are paid for each proof, the money we charge isn't even close to compensating us for the time we often spend performing the corrections. We see ourselves as the artist's partner in the reproduction process and we want the reproductions we ultimately produce from this work to be as good as possible. We realize that if we charged our full rate for this work, many artists would either accept a less accurate reproduction, or not be able to afford to make quality prints. So, we charge enough to cover our expenses, but it's in the best interest of all parties to complete the proofing in as few steps as possible and get on with the printing. What is the difference between the Decor Canvas, Designer Canvas, and Artist Canvas? The Decor canvas is printed at 600 dpi with a 6 color ink set on a lighter weight Fredrix canvas. The inks are water and scratch resistant, so no top coating is needed and this is our least expensive art canvas. The Designer Canvas is printed at 720 dpi on a medium textured, white canvas with 7 color eco-solvent based inks, which are waterproof and don't require any top coating. The Designer series canvas contains optical brighteners, or OBAs. Optical brighteners are added to the finish to make the canvas surface more white, which improves the color fidelity of the print, but can shorten the life of the reproduction since it's possible for OBAs to cause to cause yellowing over time. No one seems sure exactly what factors can cause this yellowing, or how quickly it can occur, so it's possible that these prints will last just as long as a canvas without OBAs, but we're listing the approximate longevity at 50-80 years until we see some definitive testing. Our Artist Canvas is printed at 1440 dpi on a medium textured canvas that is a little smoother than the Designer canvas for the best detail. It also uses 7 color eco-sol inks that are not affected by water, so this canvas does not require any coating to protect it from moisture and normal handling. The biggest difference between the Designer and Artist canvas is that the Artist Canvas is certified archival and OBA-free with tested longevity in excess of 100 years, and it's printed at a higher resolution for the best possible reproduction of fine details. Many images don't contain enough detail for the resolution difference to be noticeable, but since it's a higher quality product, we print at the maximum quality regardless. As we pointed out in the answer to another question, our goal is to offer the finest quality available, and then offer it for the best price we can. Since the Designer Canvas contains OBAs, it is less expensive than the Artist Canvas. It's a popular option because of its economical price and excellent color and print quality but it may not last as long as our OBA free Artist Canvas. As for which is better, in many cases the less expensive Designer Canvas is the best choice since it costs less and has good longevity and color quality. The Designer Canvas is our most popular, but It would not be a good choice for someone who wants the maximum longevity possible, because it does contain optical brighteners which have the potential to shorten the life of the canvas. The Artist Canvas is an excellent choice for those who want outstanding image quality and longevity. Why does my print match the original in certain lighting, but not in others? This phenomenon is called metamerism, and skipping the technical definition involving spectral power distribution, this is where the original and a reproduction are compared under certain lighting and seem to match, but when viewed in a different location, they no longer appear the same. The reason involves the original and the print reflecting and absorbing light differently. The reason you need to be aware of this is that there are some techniques to minimize the effect of metamerism, and you should choose a printer that understands the problem and has the ability to keep the issue to a minimum. Part of the reason metamerism can be so problematic with giclee prints is that depending upon the printer, inkset and processing method, neutral colors tend to be made up of a balance of the process colors; cyan, magenta, and yellow. When viewed under different lighting conditions, one or more of these colors can be washed out which can totally change the balance of the neutral colors. A common scenario would be that a print that was adjusted to match under incandescent lighting appears to loose magenta in daylight. 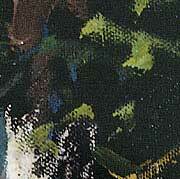 This causes the neutral colors, and as a result, the entire print, to take on a greenish cast. Similarly, a print adjusted to match the original under neutral lighting would tend to look too red or warm under incandescent lighting. So what can be done about this? A good idea is to evaluate the color match between the original and the print under the same type of lighting where you expect the print to be displayed. In most cases, prints are displayed indoors under incandescent lighting, so this would be a good choice. However, it's not always possible to know where a print will end up or what kind of lighting it will be viewed under. Another technique is adjust the color profile so that more black ink is used in the neutral areas so that the metamerism is reduced. Unless the print maker has a color management system and the knowledge to modify color profiles in this manner, they would not be able to use this technique, and there are some drawbacks to image quality if this isn't properly done. Some printers have extended ink sets that use one or more light density black or gray inks, which can be used in place of the balance of process colors described above without a risk of reduced image quality while minimizing metamerism, but again, a knowledge of creating and adjusting color profiles is necessary to take advantage of this. In our case, we utilize all of the above techniques. We evaluate color under a neutral light source, we use printers with three levels of black ink and create our profiles to utilize a maximum amount of these inks in the neutral areas to minimize metamerism while maximizing image quality. Because we create custom color profiles for each media, and use full spectral data, we can actual adjust the color profile for any media to display in a wide variety of lighting environments, so if you have a special need, let us know and we can probably accommodate you. Will my canvas prints come mounted on stretcher bars? You can specify if you want your canvas printes stretched during the order process. There are options for standard stretching and gallery wrap stretching available. Unless you choose one of these options on the order form, your canvas will be sent rolled. Keep in mind that shipping costs will generally be higher for a stretched print, especially at larger sizes, so it may be less expensive overall to order canvas prints rolled and use framers in your area to do the stretching. Can I paint on your canvas prints or remark them? Yes, all of our canvas prints can be painted on or remarked. If you plan to do extensive painting on the print, we recommend one of the less expensive canvas options, since you'll essentially be covering up the print anyway. I've seen reproductions that had actual brush strokes. Can you do that? Surface effects like this can be done in a few different ways. The most common is to use a clear impasto coating over top of the canvas print. This is usually not done very well and is an attempt to make the print look like an original. Since the brush strokes are usually applied in a random pattern that has no relation to the image, it's not a very convincing effect. However, if impasto coatings are properly applied, by matching the brush strokes of the original, the effect can be very impressive. The down side is that it's time consuming to do it properly, which is why it's not often done very well. Another method involves taking a mould of the surface of the original painting and recreating that texture in the reproduction. This is not very common and requires more of an investment since there is a set up cost involved that must be paid for, but it produces a good looking reproduction. We haven't seen any actual testing on what this process does to the longevity of the print, but it does look good. We offered impasto coatings in the past, but they were not very popular so we discontinued that option. Can you do a reproduction of a famous painting or one from a print that I have? Yes. In the case of famous paintings, the process can be a bit involved and requires some effort on your part. The first, and sometimes most difficult step is to find out where the painting resides. It will usually be a museum, but may also be a private collector. 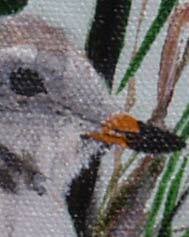 The next step is to contact the museum or collector and purchase the use of a transparency or file of the painting. Transparencies of paintings that are in the public domain will generally cost less than more recent works that are still protected by copyrights. All museums will have these available, but not all of them will be willing to loan them out. Many museums and galleries make money selling their own prints of these paintings and don't want the images getting out where customers have a choice of where to purchase a print. Unfortunately, we have yet to see one gallery or museum selling quality prints. Once you get the file or transparency, send it to us and the rest of the process is the same as for any other artwork. If the transparency isn't available, or you don't want to go to the trouble, we can work from an existing print. The cost will be higher since we'll have to scan or capture the image first, and the quality won't be as good as from a transparency, but we've been able to get very good results from very good prints, so the quality of the print will be crucial. As far as making a reproduction from paintings not in the public domain, you will need to get the artist's permission before we can reproduce any of their work. The general rule of thumb is that the painting needs to be 100 years old, or the artist has to have been dead for 50 years before the work is in the public domain. Can I group several small prints together for a larger size to save money? Yes. This is a fairly common practice. Smaller size prints cost more because they are more work for us with more trimming and more wasted media. By combining several prints onto a larger size page, you can get the lower cost per square foot of the larger print sizes. We don't trim the individual prints in this case, but it's probably worth the effort to trim them yourself for the money you will save.